As soon as I saw it written on the page I knew I’d have to try making fig-sap ricotta. The recipe comes from Spiri Tsintziras’ memoir Afternoons in Ithaca (ABC Books, 2014) about growing up in Melbourne, the daughter of Greek migrants. Fig-sap ricotta is not so much a recipe as a brief instruction, add several drops of fig sap to milk, wait 12 hours for it to set then drain the curds and there it is, ricotta. It was hard to believe that this would work – it’s almost too simple to be true. 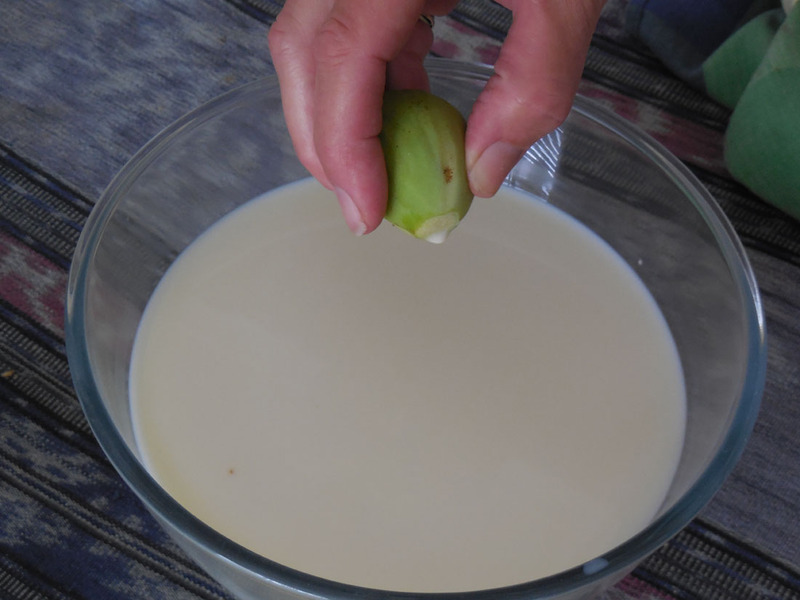 I cut two figs from our tree and squeezed a scant 3 drops of the sap into the about 1 litre of full cream milk that I had in the fridge. I did bring the milk up to room temperature before I added the sap. After mixing I covered the bowl with a clean cloth and left it to sit for twelve hours. I checked it before I went to bed, nothing much was happening. The next morning I was a bit scared that it would still be liquid. TB said to go and check it out and what do you know it had set. Amazing! Scooping the curds gently into the mould so the curds can drain. I couldn’t go past Spriri’s serving suggestions. 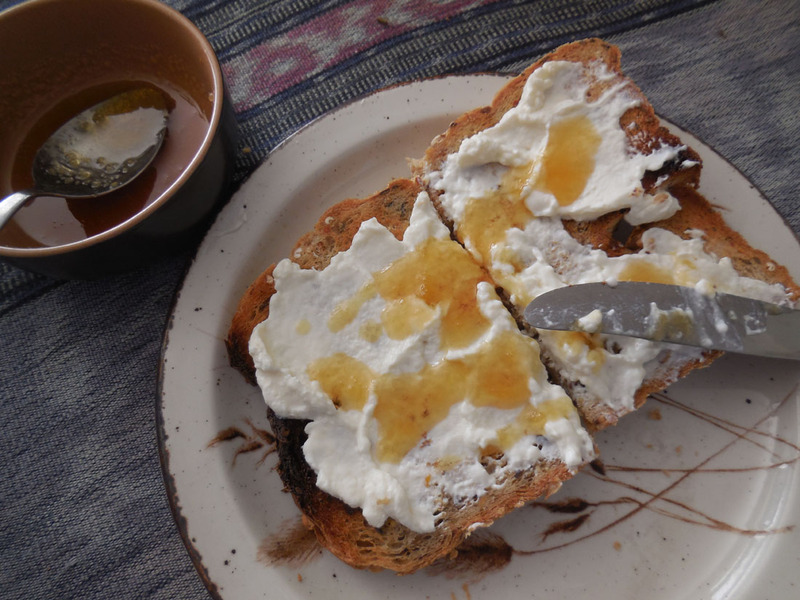 I started with breakfast – sourdough toast with the fresh ricotta drizzled with leatherwood honey. I’ve since also tried the ricotta on a great loaf of fruit bread that we bought from the markets. That also worked very well. The great thing about this ricotta is that it can be turned to sweet or savoury use. 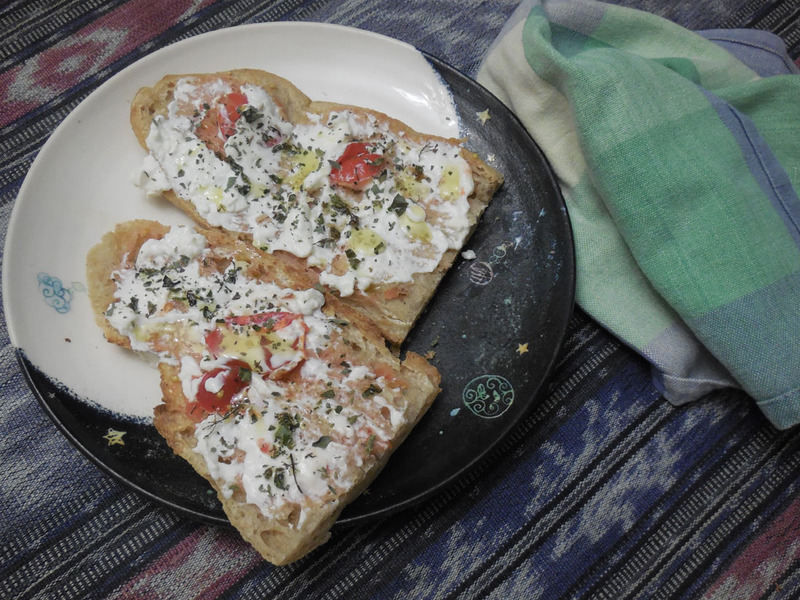 We had a light meal of one of Spiri’s favourite childhood meals, tomato rubbed into bread with ricotta, sprinkled with dried oregano and a drizzle of olive oil. What was nice is that apart from the olive oil and the milk, the tomato and oregano came from our garden and we made the bread and ricotta. That’s the way we like to enjoy the work of our hands. Given my very haphazard attempts at cheesmaking I think that this recipe will be used on a regular basis – at least while the fig sap is running. I’m still reading Spiri’s book and I would definitely recommend it. If you would like to check out more of her work you can visit her website Tribal Tomato. thanks for your comment. I used 1 litre of non-homogenised organic milk and the three drops of fig sap. I also cut two very fine slices off the top of the fig (stem end) just as a bit of extra insurance. I brought the milk to room temperature then added the sap and the two thin slices gave it a stir and then tried not to fiddle with it. I started mine in the afternoon and left it ’til the following morning. I left it draining in the fridge for the rest of the day. I’m sure it will work for you too! thanks for the Cavafy poem I really love it. This is so interesting! Where I live in Mexico, requesón (ricotta) is a common fresh cheese. I want to try making some, and using fig sap sounds intriguing. Now I just need to find a fig plant. Thanks for the article. 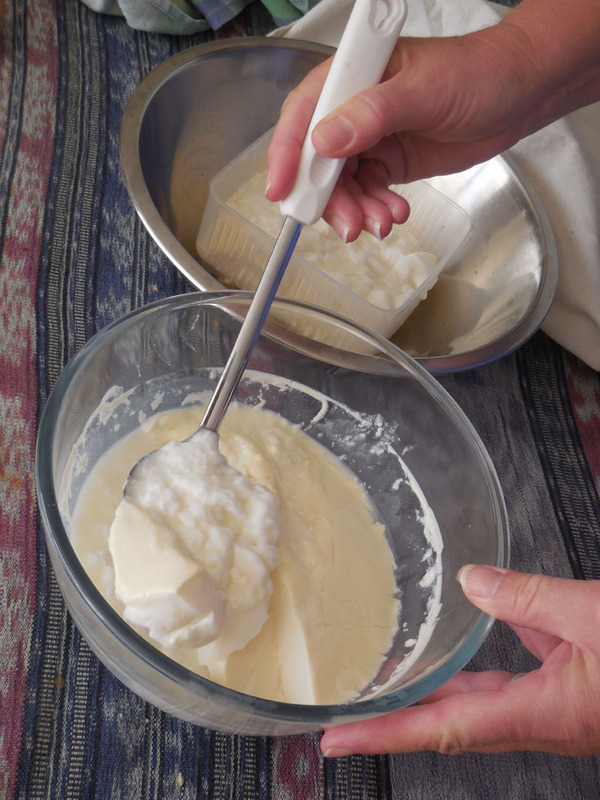 I have also made ricotta the ‘normal’ way, heating the milk and adding vinegar, but this was so much simpler. My fig has just put new leaves on since winter so now I can try it again. Hi, just wondering, could the fig sap rennet be used to coagulate milk in mozzarella cheese making, thank you for sharing! Hi Zoran, I think that it could be worth trying. My biggest reservation is that the heat required to make the mozzarella might make the sap in-effective. However it would be worth a try. I would be interested to hear how it goes, either good or bad results. Hi Leonie Andrews, yes will sure do, the thing is here in China I can`t find rennet for cheesmaking at all, and since I go vegetarian makes thing even more hard.We have Chinese water buffalloes here, I was making paneer and butter, it came out very nice.